The perfect hard-boiled egg cooker without the shell. BPA Free non-stick silicone pods make cooking eggs easier than ever! Crack the eggs into the pods, boil them, and pop them out! Make scrambled eggs, hard or soft boiled, mini -omelettes, eggs benedict and more! The Egg Boiler perfectly fits in any pot. - Cooking eggs for 16~20 minutes. - Package Contains: 6pk silicone egg cookers. - Material: Food grade PP and silicone. ►Avoid drying it without any food on it. ►Clean it up after use in order to avoid damage. New Upgraded egg cooker is hard to fall off, resistant to high temperature, so that you don't waste eggs any more. Fast and Effective for cooking delicious egg. The perfect cooked egg boil without eggshell AS SEEN ON TV. Definitely a Time Saver! This egg cooker is made of Eco-Friendly material; BPA free, non-stick silicone pod; Dishwasher Safe and easy to clean. Boiled Egg cooker makes it easy to make soft or hard boiled eggs, scrambled eggs, mini omelettes, egg benedict's and more. 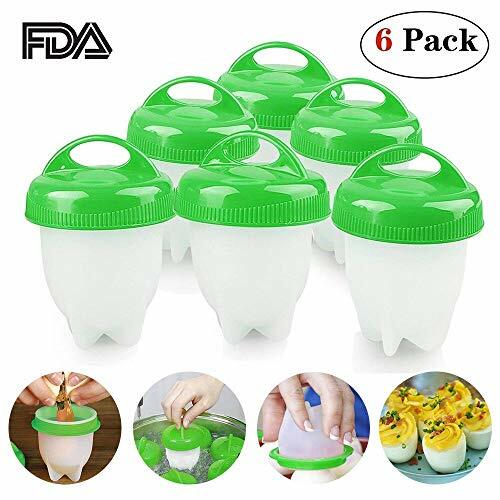 The egg cooker comes with 6 egg in package.If you are not fully satisfied with silicone egg cooker, please feel free to tell us. We will offer 100% satisfactory guarantee.